Oh, Ted Stevens. Thank you, thank you, thank you. Never has corruption been better timed nor more welcomed. The countdown has begun for the most important democratic election in the world so it's always great to hear Republicans are being jailed for the occasion. Things could only be better if Sarah Palin had lavished praise on the thieving... oh hold... this just in! What next, will she ask what the VP does? Or endorse Obama? Or support independence for Alaska? Who knows - we have days left in which she can disgrace herself a thousand times over. I am glad Sarah Palin has nice clothes though, although apparently she'd already planned to give them to charity after the election's over - I guess that means she didn't have high hopes of needing decent clobber after the voting's done then. You just need plenty of jumpers back in Alaska I guess. Lying fuckers. I'm also glad Obama loves pie. He can afford a lot of it after all those donations. Tips I call 'em, and not a single one from a Russian oligarch. I'm real glad that he's got lots of pals who've sent him good wishes. Even from people who wouldn't normally go with someone of his colour (blue). No wonder he's cocky. I'm happy for McCain too who has won the support of robots who spontaneously started making calls for him. They obviously recognised his many talents. Even if he does have an unfortunate series of tics. Don't listen to 'em John - the camera loves you baby! I'm so happy for Biden who's managed to avoid gaffing, mainly by not having any profile in the election what so ever. I mean less than that plumber guy even. I hope his inability to tap dance in front of crowds means he'll be a good Vice President. We'll see soon enough. I feel consumed by the election minutiae which has a certain fascination, but, unless you're a pie manufacturer or make clothes in the very unAmerican New York this stuff is unlikely to sway your vote. The Republicans have been fighting hell for leather to pull attention away from the economy, the wars, anything that actually matters to people but the fact is I think the American population are going to do the right thing - and big style. Not just electing Obama but ensuring that congress has got the kind of representatives that are for reversing the catastrophic Bush years. I know some on the left are, well, insistent that Obama is just the same as McCain, that there's no difference between 'em. I don't think that's right. If we had the opportunity to campaign for the 'Not Attacking Iran Act' we'd go for it hell for leather and be as excited as anything. Well Obama is that act. If we had the chance to vote for weak legislation creating progressive taxation or moving America towards renewable energy we'd fight like anything for that. Obama is that legislation. Not a magical fairy who'll sort out all our problems but genuine reforms that we explicitly call for day in and day out. It would be churlish to reject them on the basis that it isn't us delivering them when no one to the left of the Democrats has a cat in hells chance of building an alternative pole of attraction. Voting is one political act out of the hundreds we should be making every year, but it's still an act of significance. We can save lives in Iran. We can save lives in the US, and make it a fairer place. I'm not turning my nose up at that, this is an historic moment. Yes McCain and Palin have to be stopped, but Obama and Biden need to win too. That doesn't mean I wont be criticising their administration - you can bet I will - but fostering the sneering illusion that there's no difference between the two camps now only favours McCain. The death of Republican USA is drawing near. Let's prepare a world street party! You have the best photos (the Obama/Palin Strictly one). 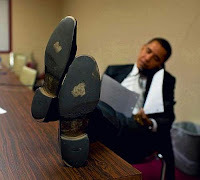 Is that the prophet Mohammed's face on the sole of Obama's shoe? What are your thoughts on government limited campaign funding, though? Where, over there or over here? It wont happen in the US. I don't think US voters would put up with it at a time when billions of dollars is getting pumped into the financial sector, and the war machine. I'm in two minds about it anyway in that it would tend to limit the capacity of "new players" arriving on the scene if the old guard are getting swathes of state money. I think one of the things that Obama's campaign shows is that you can raise big money from small donations - which is definately something we need to emulate! But didn't McCain sign up for public (i.e. limited) campaign funding, whereas Obama chose to do his own unlimited fundraising? The big cost in US elections is TV advertising. If you want less spending, the federal government needs to pay to provide more free time (2 minute blocks, a few 10 min blocks per week) on the main US networks. Or the main US networks could give up the airtime out of their civic duty. That's right Gordon - basically if you take state money then it places restrictions on you on the amount you can raise in other ways. I don't think people opt out very often which is why it was such a big deal. Obama has raised a total of $603million dollars. Almost half of that was from small donations. McCain $358million. A sixth of that was from small donations. 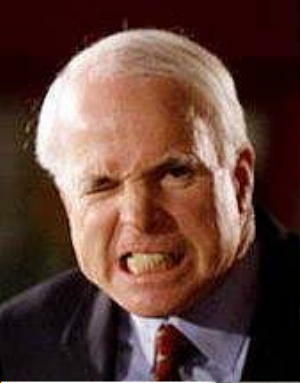 Oh - and McCain is offering $12 an hour to campaign for him - with Obama you do it for free.